Did you watch the F1 on Sunday? Did you laugh at Lewis Hamilton sulking for "only coming third"? Are you pleased to see Kimi back (even though he stuffed up qualifying)? Were you impressed by Roman Grosjean's qualifying pace? Are you nervous about the performance of the Ferrari? Is Massa a waste of space? Is Maldonado much better than he was last year? Do you wonder why the hell they let the wives and girlfriends in the pit lane? Yeah? Well you ought to buy me several beers and listen to me rant on for hours about how Massa and Hamilton should be killed. 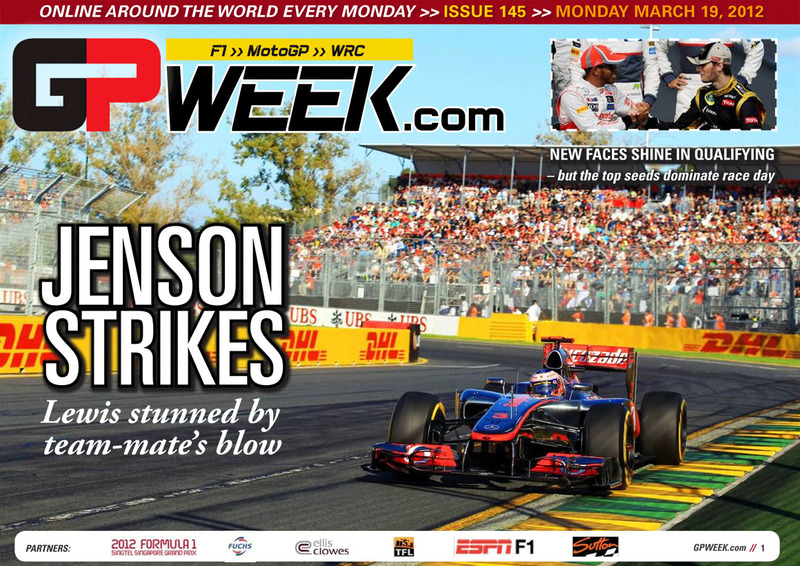 Or you should just read GP Week. It's a free magazine that's published online every Monday morning. You can read it through your browser or download it as a PDF if you'd prefer. The magazine primarily covers Formula 1, but there's sections on MotoGP motorbike racing and WRC rally too. They've got some pretty experienced writers like (my favourite) Peter Windsor, Adam Hay-Nichols, Michael Scott and Martin Holmes. Go to their site and shove your email address in the box and you'll get an email every Monday morning letting you know that the new issue is ready. They don't spam you with other mail and they're not selling anything, so it's hassle-free.